At its Universe conference in San Francisco, GitHub announced handy new features that have been added to its code repository hosting platform, which have been designed to make it easier to collaborate on software projects. 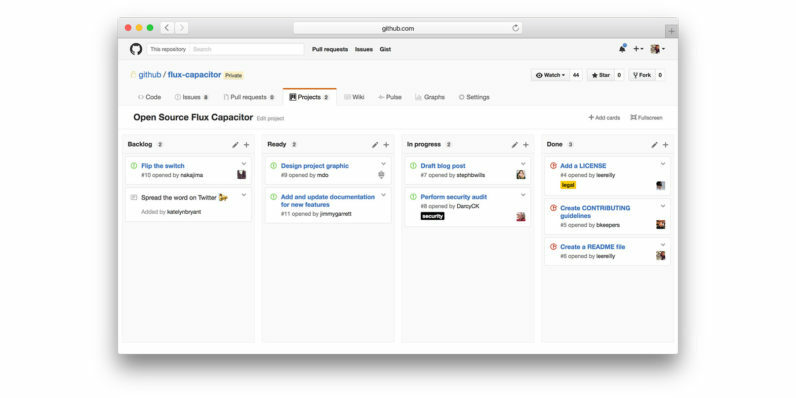 GitHub now offers a project management tool to help you organize issues and pull requests in a Kanban-style interface, which should be familiar to Trello users. You can create as many projects as you like in each of your repositories, and then set up columns to represent different phases in your project or issue types (such as ‘bugs’, ‘must-have features’ and ‘interface enhancements’). Once you’ve put a project together, you can drag and drop issues and pull requests made by others into these columns and prioritize them however you please. The service has also added Reviews, which should make it easier to critique collaborators’ code. GitHub already allowed you to comment on specific lines of code, but you can now approve or request changes to pull requests. It’s also added support for replying to inline comments on the fly; you can also add a summary note to your review and bundle comments before you send it along. These features should help coders work more effectively with colleagues and contributors on their GitHub projects. The company also announced that it would now allow third-party services to integrate their services with GitHub more easily using its improved API. In addition, developers can now opt in to try new features and APIs before they’re made available to the public. GitHub has also added other useful features like the ability for enterprise admins to turn on mandatory two-factor authentication for members. You can find the full list, as well as a platform roadmap highlighting the company’s future plans for the service on this page.